Precast light pole foundations allow you to easily place lamp poles. 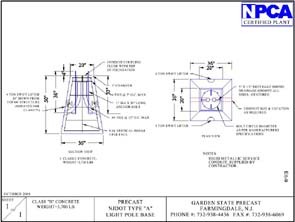 We make 18", 24", 30" diameter light pole foundations with heights up to 12'. We can make them with whatever bolt pattern you need. So stop worrying about pouring the bases in the field and give us a call.